Holistic consulting and servicing of retail real estate is becoming increasingly important in the industry. The Austrian Centerprise Group has dedicated itself precisely to this purpose, even beyond national borders. When Peter Pointner, Gerald Liebscher, and Andrei Neuwirth philosophize about retail real estate, decades of experience in brick-and-mortar retail coincide with a spirit of innovation. This detail is probably one of the reasons the three gentlemen have combined their special areas of gastronomy consulting, rental of gastronomy space, shop rental, and event marketing under a single umbrella brand. Pointner, Liebscher, and Neuwirth have recently bundled their service portfolio under the Centerprise Group name. “We do not see ourselves as pure brokers. An estate agent’s service ends when the space is leased. We view retail real estate holistically, both from a marketing perspective and from an operational point of view,” explains Pointner, whose Gastrobörse has been Austria’s market leader in the development and rental of gastronomy space for years. It is precisely this holistic approach that often determines the difference between success and failure in retail real estate. “Our big issue is sustainability. We are not simply interested in reducing vacancies. We want to find tenants for our partners who will perform well for years to come. The concept and price level of a potential tenant must, of course, match the respective location and the customer group addressed. The networks that we have built up over our years in the retail, gastronomy, and entertainment sectors enable us to find optimal tenants for retail properties,” says Liebscher, who, as former Managing Director of Vienna’s Millennium City, knows exactly what he is talking about. While a few years ago it was still sufficient to fill shopping centers with attractive anchor tenants, the situation in the industry has definitively changed. “Authenticity, individuality, and regionality are the key elements for a successful retail location,” says Liebscher. The selection of shopping partners must also be approached in the same vein. In short: “Nowadays, a center must primarily function as a regional marketplace. Ideally, this aspect should be taken into account as early as the conception phase. First and foremost, we work with investors and owners to determine what is missing and what customers need. Only then should the leasing process be dealt with,” says Pointner. This applies to new construction projects as well as refurbishments and expansions of retail properties. “Of course, it is also a matter of identifying and implementing trends at an early stage – whether in classic retail or in gastronomy,” says Pointner. In recent years, the shopping center industry has experienced a real paradigm shift, especially in gastronomy. New food concepts, such as burgers, steaks, Asian cuisine, vegetarian dishes, and vegan options, have resulted in a significant increase in the amount of space available for restaurants and bars in shopping centers, which is likely to continue in the upcoming years. On the other hand, and also as a result of increased online retailing, the space requirements of classic retailers have declined, and the search for a “hidden champion” has become increasingly urgent. However, it is also advisable to deviate from the beaten track when marketing real estate. “Classic marketing instruments, such as fashion shows or poster advertising, are no longer modern. In this respect, a level of rethinking is needed. Simply organizing an event is clearly insufficient. One must ask oneself a question concerning the increase in value of an action, how to underline the regionality and uniqueness of a center,” marketing and event specialist Neuwirth is convinced. “A targeted distribution campaign of 10-euro vouchers will certainly attract more customers than any fashion show. In addition, that money is spent inside the center and, thus, helps to boost sales,” says Neuwirth. On the subject of sales growth: The Centerprise Group has also taken this topic to heart and created the Centerprise Academy. “At the Centerprise Academy, we train shopping center employees, focusing on increasing sales, customer friendliness, and conflict management,” Liebscher reveals. While large anchor tenants regularly prescribe training programs for their employees, medium-sized and small shop operators have neither the necessary personnel nor the capacity for further training. “Our aim here is to improve overall performance. Retailers usually only train their staff professionally. We want to help improve sales within the shops,” says Pointner. “Shopping should be a holistic experience that begins before the shop is opened and does not end after payment. One often gets the impression that some salespeople are afraid of their customers. That’s where we intend to start,” adds Neuwirth. Vacancy management is also part of the Centerprise Group service portfolio. “Vacancy management does not mean simply sticking a sticker on a shop window or opening a pop-up store. There are a whole range of interesting manners in which to use vacancies in such a way that they create real added value for the center and the customer. These can include cultural events, such as readings, or making promotional space available to businesses. This is how Annelie Gullström of AMF Fastigheter describes The Lobby in Stockholm. She explained this new retail format at the game-changers session. The parameters for successful shopping center marketing are changing, reports Guido Beddig, Managing Partner at Kintyre Investments, in an interview with ACROSS. The marketing team must be familiar with the new media. 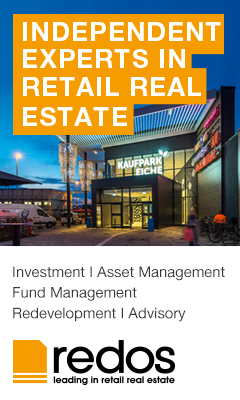 Recruitments, promotions and appointments in the European Retail Real Estate Industry. It’s Not about Shopping Center Marketing. It’s about Product Marketing. Marketing as a decisive success factor has increasingly become a focal point of center management. However, what are the key factors for successful marketing? Elke Haeffner, Center Manager of Fünf Höfe in Munich of B&L Property Management GmbH, and Sebastian Guth, Managing Director of their lead agency 21Media, discussed this issue with ACROSS. Unibail-Rodamco-Westfield has opened its first urban farm on top of So Ouest in France. The products are sold directly to customers, inside a dedicated pop-up store within the shopping center. The ACROSS Advisory Board is happy to announce its latest addition and welcomes Bill Kistler as its new member.